Today I get to preview a new book that I have been working on for the past 7 or 8 months. I had some help with this book, so I want to share a little bit about how the idea for this book came about. The idea came in the form of an e-mail, after a blog post I had done on redecorating my bedroom. I showed the shams I had made to go with my bed quilt, along with some before and afters of the room. The e-mail came from an aunt of a quilting friend, who I call “Aunt Betty”, even though she isn’t my aunt. The thing that struck me was when she said something to the effect of “We make all these beautiful quilts and then go to Target or somewhere to try to match a purchased pillow shame to our hand-made quilts. The result isn’t usually very successful”. I thought she made a very good point. Then I thought about my Mom, who has been making beautiful custom shams to match her quilts for years. We both agreed that there have to be many other quilters out there in the same predicament as “Aunt Betty” and we set out to design a collection of pillow shams together. We worked out the sketches together, Mom did much of the sewing, as she has lots of experience with home sewing, and I did some sewing along with the computer work and photography. It was a fun experience where we both got to make the best of our skills. The shot was taken in my SIL and brother’s master bedroom. I just love their room! This picture shows a variation to the large pillow in the photo above. Just changing up the fabric and adding ric rac changes the look. Notice the chunky binding around the outside edge of the pillow. It’s soooo much easier than doing piping, which is why there is no piping in this entire book! By the way, the photo above is the basic bound pillow, shown with the optional center decorative insert. This shot is taken in my sister and BIL’s master bedroom. They also have a beautiful room and I especially love that aqua blue on the walls! The next pillow shows the basic flange pillow (the small accent pillows are variations on the basic bound pillow). The flange pillow is my personal favorite, so there are LOTS of options for this one! This show is taken in my parent’s master bedroom. They have great blue walls too! This photo shows the basic flanged pillow with a contrasting fabric on the flange. The small accent pillow is another basic bound pillow with the optional applique. The woven insert – shown in our bedroom, with the bed back in place and the mud cleaned off it’s feet! The appliqued insert: Shown with the optional ric rac tucked in the seam. The last pillow option in the book has these beautiful tie-closures. The tie closures can go along the sides, as shown above, or along the top as shown below. You can also add some applique detail, if you want. Lastly, I just want to say that these pillows are not as hard as they look. I have never been much of a home sewer, so I just assumed that they were challenging. Mom started showing me the methods that she had used to make her pillow shams, I knew this was something that the average quilter or sewer could make. The simple techniques are illustrated throughout the book and added details like ric rac and covered buttons add big style with minimal effort. We hope you will be willing to give it a try! We also hope you have enjoyed this preview into what we have been doing the past 7 or so months. I always like to end the “preview” by giving away a few copies of whatever I am previewing. Many of you already know the drill – just leave a comment to be entered in the drawing. I’ll pick some winners and announce them in my next post – so be sure to stop back. This entry was posted in Decorating, Machine Quilting, Quilting and tagged custom decorator pillows with a quilting flair, flange pillows, pillow shams. Bookmark the permalink. This is something I’ve wanted to be able to do to coordinate with my quilts. The pillows and shams in your photos are absolutely gorgeous. I hope I’m lucky enough to win a copy of your new book, but if not, I’ll definitely be ready to buy one when the book’s available. All the pictures are absolutely beautiful! You’ve really enticed us all to want to sew pillows!!! I’d love to win your book. I love the idea and the pillow styles you show on your blog. I’m sure your book will be a huge success. I really enjoy your pattern ideas and the way you present them. Awesome! What a great idea and I love your designs! I love, love, love your new book! Great ideas for pillows. I definitely want a copy, so here’s to hoping I win! I’m just finishing up a quilt for my grown daughter and she’d love some pillows to go with it. These are gorgeous! I love your selection of fabrics for all the projects. I would love a copy of your book! I love it, I love it, I love it!!!! Pillows totally make the quilt just jump off the bed. Great ideas! Can’t wait to get my hands on a copy of the book. Yes, I am guilty of buying pillowcases and cushion covers in the hope they will match or contrast with a handmade item. Why hasn’t someone come up with this idea before, brilliant. These are amazing! I just made pillows for my mom to match a quilt she purchased several years ago that came without shams. Love your style… ! I love them all! The pillows and the entire beds are just beautiful. I could really put the book to good use. Thank you. oh! heather, you’ve been busy !your photos look great! I love that show with the bed outside with the fall yellow tree… The shams look fab! love that giant ric rac on them, and those solid reds are right up my alley! I think you are onto a big idea here! 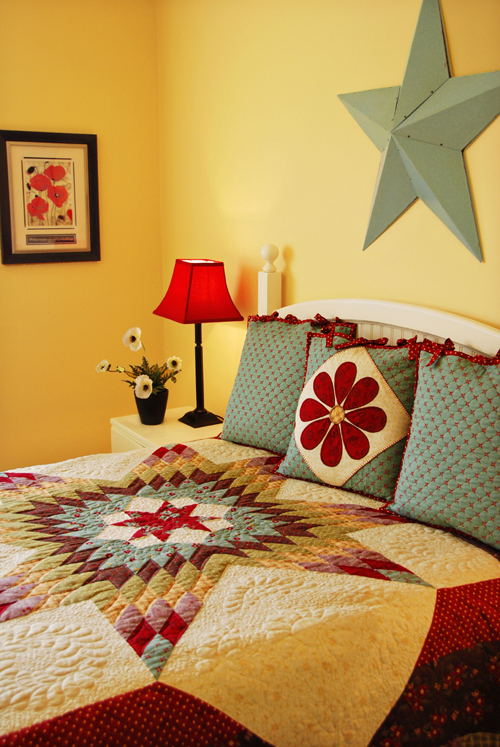 Matching shams, pillowcases, or accent pillows increase the impact of the bed quilt so much. Plus, we quilters love a rationale for buying more fabric! I love all the pillows. The photos are excellent. I am going to tell my LQS about this great book. What a great idea for a book! Your patterns are wonderful!!!! Beautiful photography! What a great idea for a book! I love all the shams. Looking forward to getting a copy. Love the new book. I always finish a quilt and think I need a pillow to go with it. This is great. Wow, you have been busy! I love these, and especially how tailored the pillows look without the dreaded piping. Can’t wait to see these new publications. Thanks so much for the generous giveaway. Wow you and your mom have been busy. I love the flange pillow, looking forward to seeing how easy the technique is. Your pictures are beautiful, you have such a styling flair! Thanks for being so generous with your talents! Love all the pillows. And again, love that you show and give so many options. Thanks for the inspiration and the chance. I would buy the book just for all those great pics. Love the ideas and I am sure this book will be as awesome as your others. I would love to win a copy! I love them! You are just too creative! Thanks for the peeks, now I can’t wait for the book! Now this is a great idea and such a practical one. It makes me want to make pillows for everything and even have the pillows I dream about but never find in the stores. I would so love to win a copy of this book! I’m not a huge fan of making pillows or shams but I really love your ideas and can definitely see myself making some – I especially like the flange and tie shams! I’m also really intrigued by the binding idea instead of piping! When will the book be available for purchase? Wow…your fabrics and patterns always amaze me. Every quilt and pillow I see, I want for my own home. Your home must be gorgeous! Now I need to go make something! Oh Heather!!! I hope I win a book, but if not, please tell me when this book will be available for purchase in our local quilt shops???? I have purchased two of your books, and adore your patterns. I can’t wait to get my hot little hands on this book too! Kudos to you and your Mom both!!! This book makes me want to sew even if I don’t quilt. I could make the grandkids pillows. The pillows are great. They really help finish off the look of the quilt. Those are lovely! Thanks for the chance. What a great book! I love sewing shams when I finish a bed quilt. These styles are just awesome! This book looks awesome! If I don’t win a copy (*wink*) I will have to pick up a copy. Its so beautiful-as all your stuff is! what a fun pattern book! 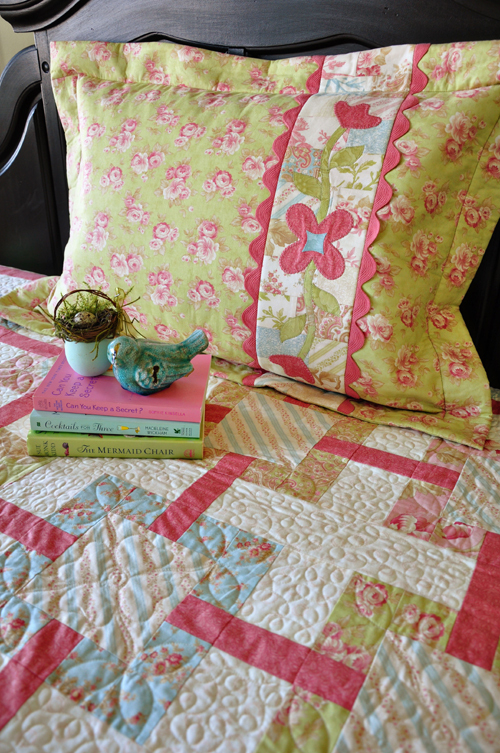 i love how a sham adds so much to a quilt…thanks for a chance at this book! beautiful work. Only one word to say: Beautiful!!!! Beautiful is the only word I can think of. Classy. That is two words. Two more….fingers crossed! Awesome! I can’t wait to get my hands on this book! I LOVE this idea! The details are fantastic…covered buttons and cute tie closures. I don’t know which one I would make first. They are beautiful, and the perfect finishing touch when you’ve made a bedquilt. Would love a copy of this book! I’ve always found anything except your basic pillow cover challenging so I’m really looking forward to your new books for guidance. I’m a visual kind of girl! Lovely pillows – much better than anything store brought! What a wonderful idea for a book and so well done! I will definitely have to add this book to my collection and put it to good use! Thanks for the preview – what a variety of wonderful ideas! My rooms can use new pillows! Heather, you are the best. I’ve been struggling with how to do shams for one of my quilts. I can’t wait until it’s available in stores! Thank you. Thank you. Thank you. Makes me want to redecorate my entire house. Beautiful. The pillows are wonderful and this is a great idea. Wow what great idea’s. And the colors are all so beautiful. I love all of these beautiful shams…what great inspirations! Thanks so much for the preview…I’m getting ready to start one of your quilts using “Meadowsweet”…maybe I should get some more fabric now for matching shams!!! What beautiful pillows! I remember the one with the woven insert on your bed from months ago and thinking how pretty it was! I’m so glad the pattern will be available. Thanks so much! The pillows are awesome! Just this week I had a lesson in doing piping so I could make some shams. This book is perfect and has so much flair! Thanks so much. Wow, Heather, I’ve made shams and pillows before but you make it look like I never thought about what I could really do with them! Beautiful, I’m crossing my fingers for a lucky draw! As usual, beautiful designs! I am currently in process of deciding what pillows to make to go with the kaleidoscope quilts (your pattern) I just completed for my girls. I’d love to win a copy of this book! As always you have beautiful patterns and ideas and you make me want to sew, sew, sew. I’d love to win a copy of your latest book!! Oh, I can’t tell you how MUCH I LOVE THESE… Until I started quilting so much of what I have sewn is lined/drapes, duvets,etc…. this really helps pull it all together for me. I loved the bento bed runner & pillows that you previously did, this takes it all so much further. Great Job… this is definately what people are looking for! BTW, what is the pattern for the quilt on your moms bed? I love the use of the black! Wow! I love each and every sham. 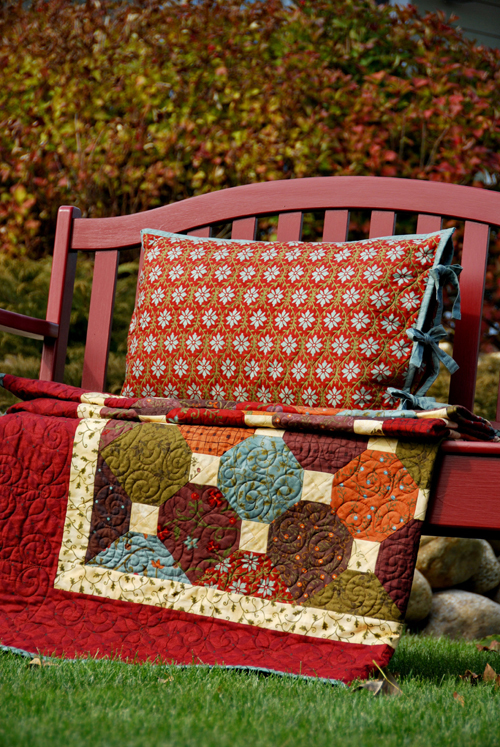 What a great idea to showcase decorator shams for the quilter. You have published this just in time! I have been wanting to make new pillows for my sofa and guest room… but I felt somewhat intimidated by it all. You are a life saver!!! I’m not sure which I like better…the shams or the photography. You did a fabulous job, as usual. And I’m sure you made Aunt Betty’s day. Maybe even her week! Oh, what a brilliant idea! It sent me scurrying to look at my leftover fabrics to see what could make pillows. Can’t wait to own this fun book! O.K. I am so speechless right now. I am a big fan of yours and you have completely blown my socks off right now. Those pictures were amazing. The quilts were gorgeous (I recognize a few and am dying over many others) and the pillows!!! The pillows are perfect, beautiful, fun. Geez. you outdid yourselves this time. And you’ve completly inspired me to make some shams to go with my bed quilts or just add some fun throw pillows to what I’ve already got. Great job!!! These are great pillow sham ideas. I love all the options you have given. I am just redoing my bedroom. Would love to win a book. Somehow I have to find a way to scrimp out enough fabric from what I could find of the brown Rebel Roses fabric! It will be gorgeous in pillow shams! What beautiful pillows and neat ideas. So beautiful! I think your new book is great! Thanks for the giveaway! Love them! Can’t wait to find your new stuff at the quilt shops! What makes this book exciting is not only the pillow styles, buy how they are worked with quilting fabrics and room decoration/quilts. I think it’s inspiring in a way where I want to do more than just throw a piece of deco fabric on a pillow form, I want to design it more now! Thanks for the giveaway! Oh could I put this book to good use! What a great book idea… Thanks for the chance to win a copy. Wow, what a great book. You’ve hit on something I’ve been thinking about and wanting to do. Now you are showing me how. Thanks. I just purchased 3 of your books and would like to add this one. What a great idea! I’ve been trying to decide what kind of home dec theme to set up at our new house, and I’m leaning towards going with all neutral slipcovers, etc., then using interchangeable pillows, throws, etc. to change the look with the seasons. This would be a great resource!! Your colors are always just so gorgeous! Makes my mouth water! Love the pillows! 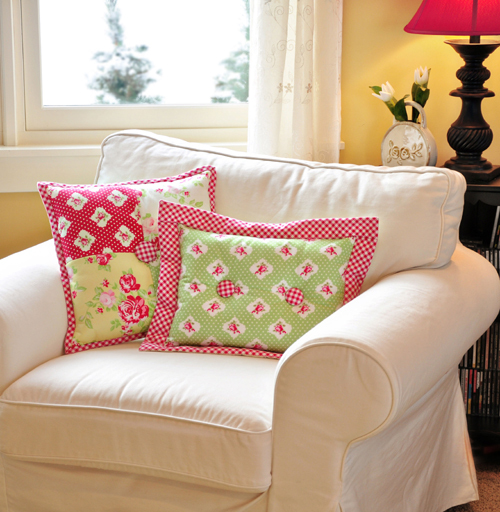 I have always loved making pillows – they add so much to a room. I make pillows to match my table runners for my dining room to throw on a bench in the corner. Thanks it looks like a great book. Thanks for a chance at this book, I would love to work with these patterns! what a fabulous idea! it makes so much sense! Oh my goodness, how fun!! I love the variety you give as examples so one can “spice” it up with more than one shape/design. I just love the idea of the inserts – how very cool. Heather, you just amaze me with your creative talent and ideas. It must be wonderful to work along side your Mom..
Seiwng hugs and blessings to you both. What a great way to use all the leftovers from my quilts. I had been sewing them willy nilly into larger pieces for the quilt backing, but this is so much better! This book is so timely for me. I’ve been having an itch to make new stuff for the MBR and the pillow ideas are great. And so are the fabrics you chose! What a grand idea! The pillows really do make the quilts look more beautiful. I wish you much success with your new book. Oh, please, magic picker machine … pick me, pick me!!! This looks like another winning book! And since I’m pretty sure I have most of your books, I need this one too. Great idea for a book. Thank you and your mother for the new book. Every time that I want to make a sham or pillow, I have to hunt all over for a pattern and/or picture. Now I will be able to find it all in one place. Good job! Your sham patterns are great. I have been looking through home sewing pattern catalogs for something to inspire me to make shams and this did the trick! On an unrelated note, you are such a prolific quilter, do you ever plan to do a ‘scrap’ quilt book? I know you give great tips on runners and other things that can be made from leftover quilt pieces, but what about the fabric scraps? I am a novice but already have an overflowing tub of scraps and chunks of fabric. I love these Heather! I have been planning to run to Pottery Barn Kids to purchase a sham for my daughters bed (I am working on the quilt now) but I will definately wait for this book to come out instead! The ideas are already bouncing around in my head! I’m not a fan of the pillow tuck, either, so I love all of your pillow ideas. I’ve purchased all the fabrics I need for my bedroom so I could really use your new book! Thanks for the giveway! Would love to win your book…..the pillows are gorgeous! Oh my goodness I am in LOVE with this new book! How fun. You sure have some beautiful patterns. I look forward to going through and finding some pillows to make for our family room! What a wonderful idea for a book. You are so right, pillows just add so much. If us quilters can make quilts why not pillows to go with them! I hope I win so I can try making some pillows. Fun and functional! What more could you ask for? Very nice! If I don’t win, I’m going to get a copy for myself. I love all the ideas so far. There’s lots of options. Thanks for putting it in a book. I’m with you on having matching or coordinating pillow shams–I made my own to match a throw I made for our bed. It adds so much to the room! Your photos are gorgeous and definitely new and fresh designs to plunge into making 🙂 One question: do the pillows have purchased inserts or are they stuffed? I love the shams! I am thinking about making a quilt for my bed and was wondering what to do about the shams. It must be so fun to have a mom who shares your love of quilting. This is great! I have wanted something like this for a long time. Love, love, love everything! Thanks for the chance to win a copy of the book. One of my friends was just asking me if I had a pattern for pillow shams. Wait til I show her your post. We will both be in line to buy the book when it comes out. Love all the different options. Couldn’t be better timing! I am just buying fabric to cover two windowseat cushions and create pillows to match (plus decorative pillows for the beds, of course). I could really use this book–I mean really USE it! When will it be released? Did I miss that? I love this!! 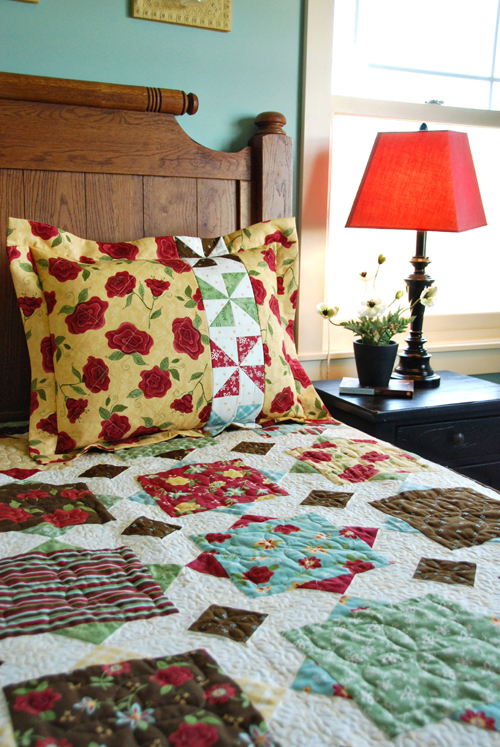 I have always preferred not to tuck my pillows, but never knew what to do about making shams to go with my quilts. I was never too excited about making shams using the same pattern as my quilt and being too matchy. I love what you have done. I’ll definately try and buy a copy if I don’t win. Do you have a UK supplier? This book is exactly what I’ve been looking/hoping for for the past year or so! I’m so excited that my wish for this sort of book to be published is coming true. Love your patterns, Heather! I have been wanting to use extra fabric from some of my quilts to make shams because I have loved the ones in your pictures. I am really excited about this book! I LOVE these pillows. I have been doing exactly what you mentioned in your blog – going to Target, Home Goods, etc to buy shams to try to match my quilts. I can’t wait for your pillowcase book to come out! What a great idea for a book, something long needed. Guess I better get on line and find more of the fabric I’ve been using to make my daughters wedding quilt, I know she’ll want some shams to match. I wish I was Aunt Betty so I would be ensured a copy but alas, I am not…just a simply cousin Jo…(not really). Cudos to you and your mom. This just might be something I do. I don’t even get as far as Target. My poor bed is totally shamless. Thanks for the inspiration! I am so excited about your new book. I am planning on making a new quilt for my bed this spring and i was wondering what I was going to do about the pillows! Now I don’t have to wonder! I would love to win a book! I promise to put it to good use!!!! Me, Please! I love your new book. The pillows are awesome…and I am thinking I would love to make them. Wonderful idea! Loved the preview. I was just about to make some new pillowcases for my bed, now I want to make some of your lovely shams! Your new book is a wonderful addition to a quilter’s library! thanks for such beautiful eye candy, and for the chance to win your new book! What wonderful eye candy! Your pictures are just “the best”. 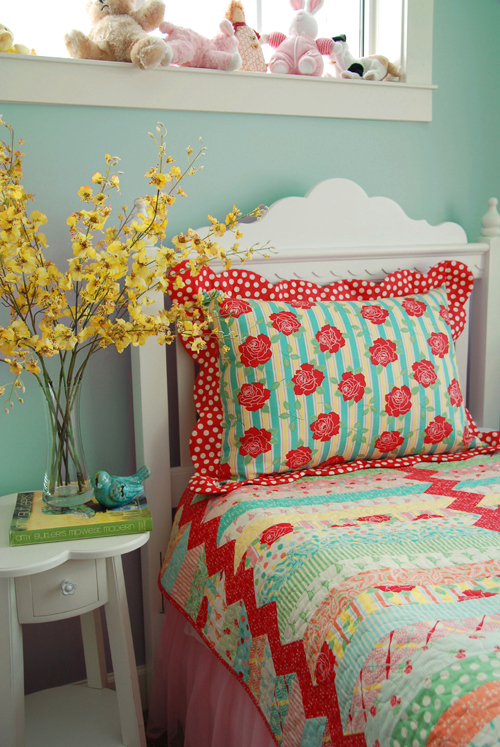 The shams really give a “decorator” look to the room (the quilts are gorgeous as well)! Great idea! Would love to win a copy. Beautiful pillows and excellent photography. You make me want to make pillows to match all my quilts! Love this – hope I win a copy – we need new shams. How inspiring are these? What a fresh idea for a pattern book. Great thinking, Aunt Betty! 🙂 I so hope I win. They are all just, WOW!! I love the pillows and the way they just go so well with the quilts and the beds and just everything. Congrats on the new book! I would love to have the opportunity to win one. Thank you! You are absolutely right Heather, everybody feels that their “home” could use some sprucing up! My daughter has a wonderful quilt in her dorm room that I made her. I made a couple of pillowcases to match with two real simple quilted pillowshams. Your ideas would lend sooooo much more to her dorm room and really spruce up her “home”! We are about to move house and I had decided that a bedroom makeover was definitely needed for the new house. These cushions would be a perfect contribution to that! What a great idea for a book! I always have some fabric left over from the quilt and this would be a great way to use it up! Can’t wait for that book to hit the shelves, as I need to make some pillows for myself. What great ideas! What a wonderful designer you are! They all look gorgeous and your fabric selections are just divine. All thet eye candy on one post has made me feel dizzy. Just going to lie down now and dream about pillows. OOOHHHH and AAAHHHH!! What a wonderful showcase of beautiful quilts with spectacular pillows! You have hit a jackpot!! I will be anxiously awaiting the book’s arrival in my quilt shop. I would HEART a copy very much!!!! So lovely. Love the binding that resembles piping. So many beautiful choices – makes it hard to decide which to do first. Unreal, they look awesome and not difficult. I love all the options and the fun style they can easily add to any room. Also they look like sewing that can be taught to my tweenies! The bonus is the stash gets to be seen!!! Wish I still owed The Girlfriends Quilt Shop because I know for sure this book would be a top seller! 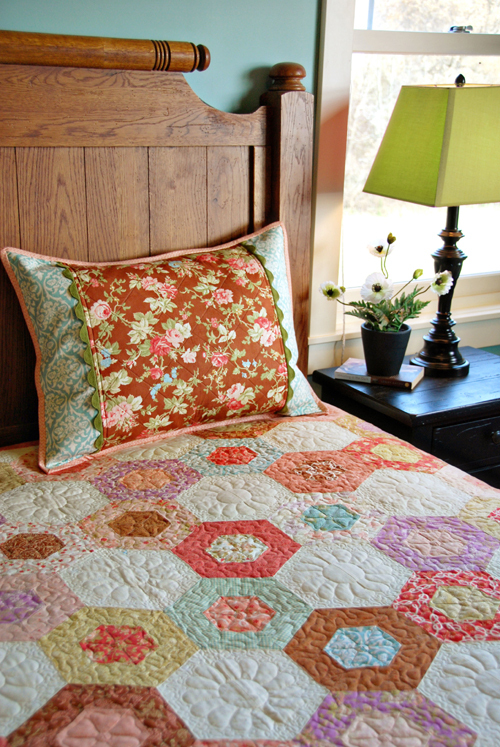 Beautiful quilts, pillows and shams. Love books that have more than one kind of project! What a good idea! You’re right – all that work on the quilt next to the blah pillows. Wow! Great ideas for pillows. I love these kind of books. I love all of these pillows. Never thought I would want to make pillows for my bed until I see what you’ve done here. Can’t wait for the book, when does it come out? Isn’t it wonderful where the ‘what if’ comment can take you! The preview is great, sure to be a winner! I’d love to win one! Nice…definately something I would tackle after seeing your great photo inspiration!! Wow!! What a fabulous idea!! I know that I have purchased shams on my bed with my hand made quilts and it’s just my wishful thinking that they even come close to matching!! Sign me up for a copy – Thanks Heather!! Once again, you’ve done a great job. I can’t wait to see the book. LOVE these – I have lots of pillows – but all of these are so much more appealing than mine! Can I just say you are my sewing hero. I love each and everyone of your projects. It is nice that you do all the thinking for me, and I just have to follow your directions. I can’t wait to get my hands on this new book. the odds of my winning a copy aren’t great but I still want to say what a great idea and I’ll be watching for my opportunity to pick up my copy asap! Oh my goodness! I love this concept! The pillows are beautiful… oh, to have more time! I would love a chance to win a copy! OMG, you are sooooo talented! I know you are showing off your new book, but you are teasing us to not mention the lovely quilt names too – so we can buy the patterns or books! 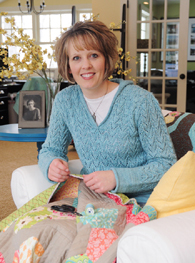 You rock as a fabric designer, quilt designer, decorator, and blogger! I just love making pillows. I just finished helping my neighbor make her quilt. I told her that I would make her shams and curtains. This book would sure help. These are absolutely adorable. I know I would be making every single one of them. You are such an inspiration to quilters and sewers alike. Absolutely fantastic! I never thought of doing pillow shams before and it really does make the whole thing go together. Wonderful ! Beautiful, I will definitely be making some of these pillows! 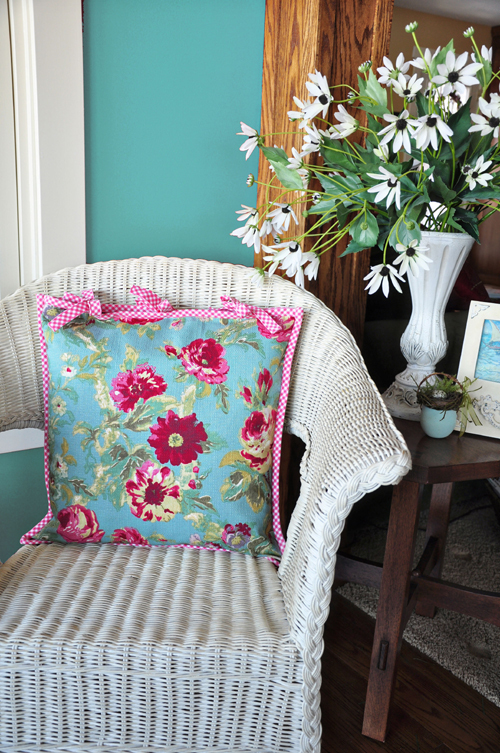 I’ve bee sewing pillows for years but your take on them is so refreshing. I love the scalloped edge sham. Stunning!!! What a wonderful ideal. I just love it! I always encounter some stress and then procrastination (due to the stress) when I design my own items. I love your style and it takes all the stress out of it for me; you’ve already done all the figuring about how much fabric to purchase, and what size to cut the pieces. I just love your pillows! May make some to match the old quilt I have on my bed right now. Thank you for sharing your gifts with us! You are so talented! Do you have in your archives anywhere how you got into this line of work? I would love to hear your story! O, Heather, these are absolutely wonderful. They just complete the whole bed! Of course, the fabrics that you use are fabulous too! Love Love Love. Can’t wait to get a copy! Will have to get started on my next bed quilt and pillow this weekend. I love, love, love them! I too struggle with picking pillows to match my quilts. Matching pillowcases are nice but these have so much more style! Thanks for letting me enter your contest. Oh, I am so excited! I’ve been itching to make some decorative pillows, and this book just gives me tons of ideas. Thank you so much! You always make things look like I can do them!!! Great work! Your pillows are awesome and the book looks totally inspiring. I would love to win a book, so sign me up, please! What a great idea! I know I’m able to create a pattern for pillows, I just choose not to and buy them anyway. Thanks for writing the book. I would love to have some tips on making decorative pillows. This book would be a big help to me. I just told my husband this past weekend that I was thinking about making some pillows to match our quilt that I love … this would be great to win! Love so many of the patterns! What a fabulous idea! I know you have a real winner with this new book. What a fantastic idea! I will be so mucb more likely to use quilts on the bed if I’ve got a matching pillow!! The pillows are great! I am planning to paint our bedroom, make a new quilt and now add beautiful pillow shams as well. Love your ideas – the pictures are wonderful! Love the idea of making matching pillow shams. Congratulations on your new book! How fun and clever! I love the different designs and would love a chance to win a copy (or will buy one if I don’t win). Congrats on the new book! What makes this so very fun is all the variations you show. If this doesn’t make one want to sew, then nothing will! This is just what I need to make several of my rooms look cheerier. You didn’t say when this pattern would be available to purchase. ?? Can’t wait! LOVE LOVE LOVE the designs, can’t wait to try some! I’m starting to want to redecorate the bedroom and these are inspiring! Thanks! Your pillows are the perfect finishing touch. Thanks for the great ideas. Amazing – you and your mom are talented ladies. Thanks for the great ideas. This book will be a great addition to our library. Of course it would be better if a won copy found it’s way into the book self. As always beautiful quilts and patterns. Please enter me in the drawing. The fabrics is so vibrant. Can’t wait for this book! Love the designs. Thank you for this great book! I work in a quilt shop and can’t wait to offer this to our customers! Do you know when it will be released? (it’s not on Checker’s website yet ) You really have no idea how great this is – we have been talking about writing some patterns to do just this – and thanks to you – we don’t have to! It’s a win-win!!!! Wow, I knew you and mom could do a beautiful job. Looks like your blog friends all think you did too. I noticed Fat Quarter Shop already has it listed- and ready to be ordered. Congratulations. Can’t wait until your book is available! I have been looking for pillow sham ideas to to use up left over fabric from a quilt that I just made. What fantastic pillow patterns! I especially like the big appliqued flower pillows. Boy, could I have fun with this set of patterns…fingers crossed that I win! I am so excited about your book! I am moving to a new house out in the country and can’t wait to make lots of quilts and pillows for every room in the house! Oh my, every single one is beautiful! I would love to win! You are so right about trying to find pillows and shams to match our quilts! I will definitely be getting this one! Thanks for a great chance to win your new book. Wow, your cushions are so “just right” they set each of the quilts off and yet make a statement on their own. I love these!! I will be making them as soon as I can get my mands on this book! You are amazing! Oh, what fun! I would love to make some of these to go with my quilts. You’ve put together another beautiful book!! Darling pillows and shams! My bedroom needs sprucing up and I think this is the book to help me get it done. I’ll be looking for it in my local quilt shop! I love the variety of options. This looks like a great book! What a wonderful idea! I’m so glad you’ve put this book together. Everytime I’ve made a quilt and there’s extra fabric left over, I say I’ll make a pillow to match. So far, zero pillows! Maybe having the direction and inspiration of your book, I’d actually get them done! You’ve out done yourself again Heather! “I have never been a big fan of the pillow tuck.” How true. I’ve often used the pillow tuck since I didn’t know how to make a nice sham. I’m sure this book will help me out. Thanks Heather! These pictures are so inspirational, Heather! I’ve often thought I need to add some colorful pillows to my living room sofa, but just haven’t gotten it done. I’d love to win your book to get me started! Your Amazing.I Love your house and the quilts showen with the pillows. A Pillow Sham instruction book–what a great idea! You always come up with the very best ideas and your pictures of the projects are always marvelous. Thanks again for a wonderful guide. Sure could use this project book. Thanks for the detailed review. Thanks for counting me in. Absolutely Brilliant! I sure hope I will be able to find this book up here in Canada! Or better yet, if I was to win a copy that would be even better! Love the new book and all the wonderul pictures! I am so inspired! Love the pillows! Your work is beautiful as always! Love the pillows. Great new ideas and need to make some of these. Love how you set up the pictures. Thanks for sharing. What a great idea! I just love all of them and cannot wait to get the book. Your imagination and creativity just amaze me. Great book Heather! So many great ideas and option to dress up a room! Wow, what beautiful pillows! You amaze me. Super looking book and great photography. Well done! You are so right–the shams make the beautiful quilts even better—-these are the best…. These pillows look so smart and quite do-able. I’ve also never been one to do much of the home-dec sewing, but I can surely tackle these. Well done! Great idea. Love the tie pillows! Just gorgous! I can’t wait for this book…. I think it would be great to make some shams to go with a gift quilt. Also just making a customized pillow as a quick gift would be wonderful too. These would be a great way to use the orphan blocks that can be left over after making a quilt. (you know those “less than perfect” blocks that have a piece that is off kilter or maybe didn’t have the right seam allowance.) I see endless possibilities. I am a pillow lover. I already have some ideas just from your preview. my amazement at your talent is endless! So cute! I’m in the process of doing coordinating quilts for my kids beds and you have given me some great ideas for shams! Hadn’t gotten that far yet:) Thanks!! omg, they are beautiful. I now want to make pillows for my quilts. They really set off those quilts beautifully. And how awesome that you and your mom worked on them together. I love the pillows! Can’t wait to buy the book! As always, your book looks amazing! What a fabulous way to add new life to your bedrooms & living rooms. Just what my house needs! Thanks for the great giveaway and for all the wonderful creative ideas you have!!! Beautiful shams! The fall photo with your bed outside is fabulous. What line of fabric is it? love the new patterns….great finishing touch. What a neat book!! I can hardly wait to try some of these to coordinate with my quilts. Thanks so much for sharing you talent! That is just brilliant! Those designs are so cheery and darling and cute…. it makes perfect sense! Thank you! Thank you to you and your mom for all of your hard work, and your husband for moving the bed. Quilted pillows are a great thing to add to a bed. Great work Heather! 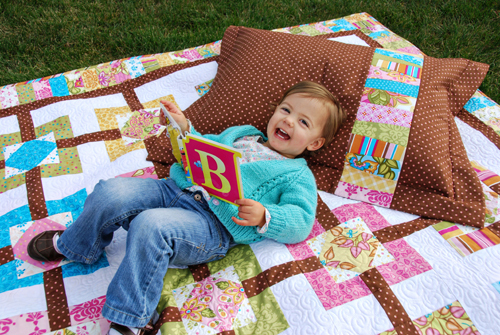 I am debating making a new quilt and shams for my daughter. This would be PERFECT. What a treasure of possibilities…the best type of book! Those pillows and shams are beautiful — definitely on my “to do” list. Thanks for the opportunity to win! I love, love, love the pillows. They do add so much to the look of the quilt. It is definitely a book I would use alot. OMG, your pillows look fantastic. I have never really coordinated pillows with my quilts, but I can really see it in my future. Thanks for the preview, I would LOVE to win one of your books. Excellent! I saw on some website, I can’t remember which, earlier this week that this book was coming and I got very excited!! I’m making a full size quilt for my daughter’s bed and was thinking what I was going to do for pillow shams. this is it! You answered my question! So darling! I can’t wait to add pillows into my home. They look so cozy! I can’t wait for the book. You have such a great sense of style with color and design. I always look forward to your new creations! I love this! I just bought pillow shams at target to match my homemade quilt. I can’t wait to make my own now! I will be returning my store bought shams and making my custom shams. Your patterns are always my go-to patterns anytime I make a new quilt! I love the idea of matching pillowcases. You did a great job! Gorgeous!!! For the last few years I have been buying “extra fabric” for pillow cases, but they always end up looking so plain next to an intricately pieced quilt, and Target only has so many choices….now I can just make them myself. Congrats Heather, great job!!! Wow! You’ve got a winner here! 🙂 When will it be available? (I never win anything, so I want to know when I will be able to buy it.) You have definitely inspired me. Thank you! Love your work, color design, inspirations, and even the snow. I left MN 30 yrs ago and live in TX but I miss the colors! I ENJOY reading about “back home” on your blog. Keep up the great work. Thank you so much. I have often tried to think of a way to showcase a bed quilt with the ‘rest of the stuff’. Do you think you would consider putting a book together for window treatments and dust ruffles as well? Heather – your book look WONDERFUL. I too am a BIG fan of pillows. We have 8 pillows and 3 cushion on our bed everyday. My husband says it takes longer to clear the bed to sleep in it, than a good night’s sleep! Just imagine, all of those pillows with your wonderful covers ……….. brings a huge smile just thinking about it! Wow, I’m willing to try my hand at pillow sham and pillow sewing. I would love to win a copy of the book. All your hard work with your mom is gorgeous, as usual. Congratulations on another book!! These are great pictures. I will have to make some pillows. Thanks. Wow, I love your new book. Those all look so doable. Really enjoy your work and your blog. love love love your new book. I have been waiting a long time for this kind of resource. Thank you for doing this and putting your wonderful twist on it. Love the idea of no piping. Your photos are awesome! Thanks for the giveaway. I have always played with decorator fabric, but the quilting fabric will be a much better match with my quilts. What a fantastic book – I will definitely be looking for it (if I don’t win it!) 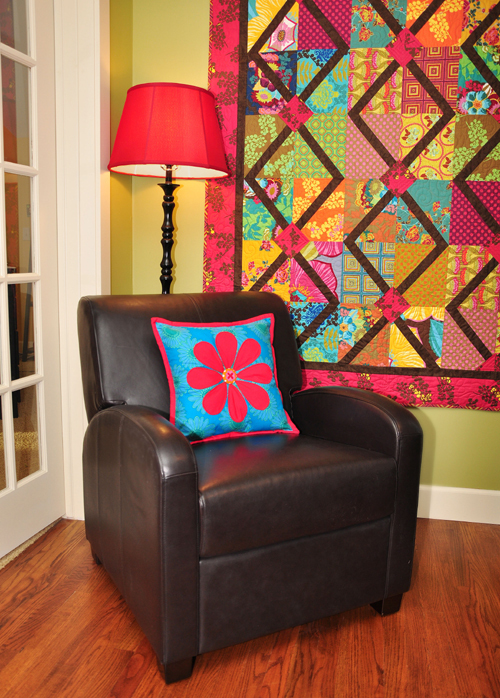 to include pillows with the quilts I make! Those pillows are amazing! I’ve made a few pillows already but that dreaded piping…these pillows look WAY better! Hope I win…if not I have quite a list of your books to get! Heather these are terrific ideas. It would really finish off any room and make it look all put together. Love it, love it, love it. Another cute book, Heather! These will make quick gifts when there isn’t time to make a big quilt, too. Hola, Heather!!! Realmente ese libro es GRANDIOSO! Adoro la selección de telas y la combinación que hicieron en cada uno de sus proyectos! Felicitaciones a Ud. y su Madre!!! Sencillamente: MARAVILLOSO! Sería un honor contar con la copia de regalo de vuestro libro, autografiada por ambas! Un fuerte abrazo! BEAUTIFUL! 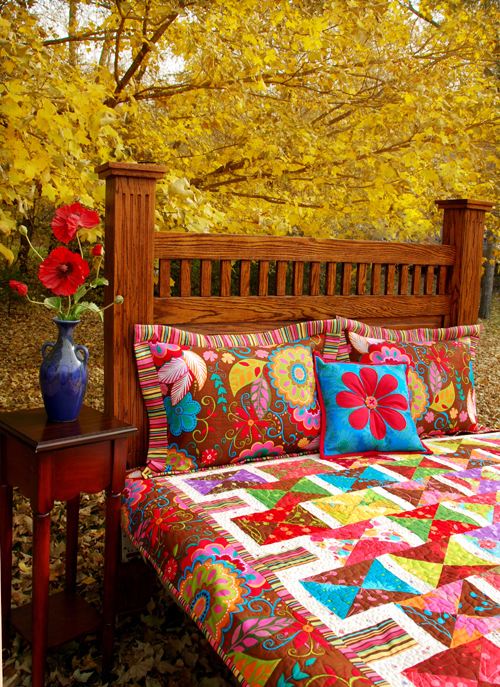 This is just what I need…such pretty quilts for the bed and I always wonder how to finish the look…here is the answer! I love the pillows/shams! They make the quilt really sparkle and pop! Your new book looks wonderful! I am not very talented with Home Dec things, but you have convinced me that I can jazz things up a bit! I enjoyed looking at the photos and trying to figure out which book of yours contains the patters! Mabye even I can put a look together! Thanks to you, your Mom, and Aunt Betty for doing this book! I love your shams. What a great idea!! Beautiful shams and decorating ideas. What a difference they make! What a brilliant idea. My bed and my daughters could definately use some of these. Thank you so much for taking the guess work out of it. Hi Heather, I love the pillow styles. I’m in the midst of a quilting weekend and one of my friends just made pillow cases (nothing quite as detailed as yours, but gorgeous nonetheless). Her comment was “If I don’t do this the remainder of the fabric it gets put back on the shelf and may never see the light of day..this way I use up most of the fabric bought for the quilt” and boy does it make the quilt shine too. Thanks for the chance to win this book it looks terrific. Absolutely beautiful! Love the photos, they are very inspiring! Really nice designs. Just the thing to spice up a bed. I think my room could use those cute pinwheels. What a great idea! I especially like the pillows with tie-closures. They all look so beautiful! What a great idea. Love, love, love the new book idea! When will it be available? Love the pillows – I am making one of your quilts right now and can’t wait for the book to come out to compliment it with a few pillows! These are all so great. Lovely pictures. You have such wonderful designs. Absolutely genius! I cannot wait to try every pillow! I love all of these pillow ideas. Can’t wait to see the book in person and try them out. An absolutely brilliant idea! Your pillow ideas are great. I suppose I have to finish a quilt to match the pillows. ;0) I liked the out door shot. I think that you and Joel should have “slept under the stars” to make the move worth the effort. Very beautiful! 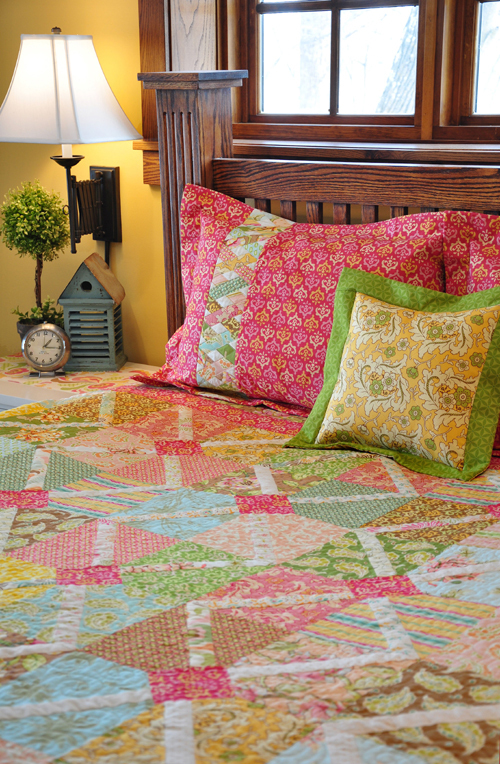 Just curious…did you make all the quilts to match the shams or did you make shams to match existing quilts? love the book, they all look wonderful! I love your new book! We are redoing our bedroom…with new aqua walls I might add…so this is perfect timing! I can’t wait to make some new pillows to complete the remodel. These pillows are amazing! I want to make at least one of each style! I just love the patterns in this new book. I can see a bedroom makeover happening soon. I really like your new pillow pattern. 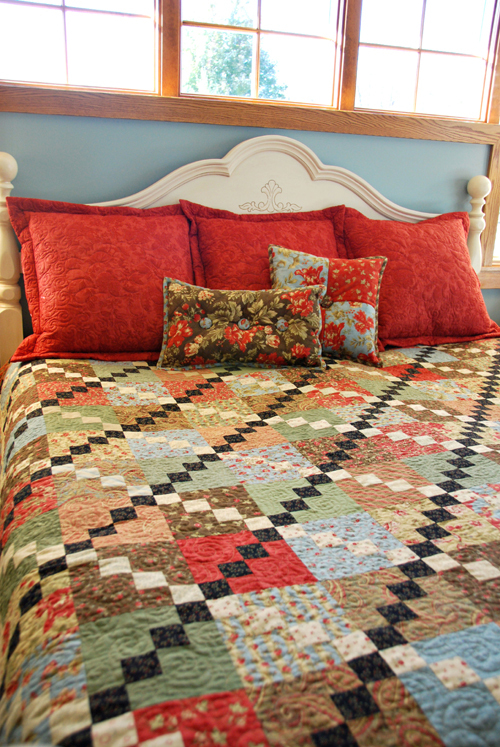 It adds so much to the quilts on the beds and gives them a current decorator’s touch. Would love to win a copy of your book. Do you sleep? Your head must never hit the pillow. What wonderful ideas! Totally makes sense to have a complete ensemble for bed quilts. Beautiful pillows!! I can’t wait to get this book. What great pillows!! What great accents to quilts!! Thanks to both you and your mom for this wonderful book to add to our sewing libraries! 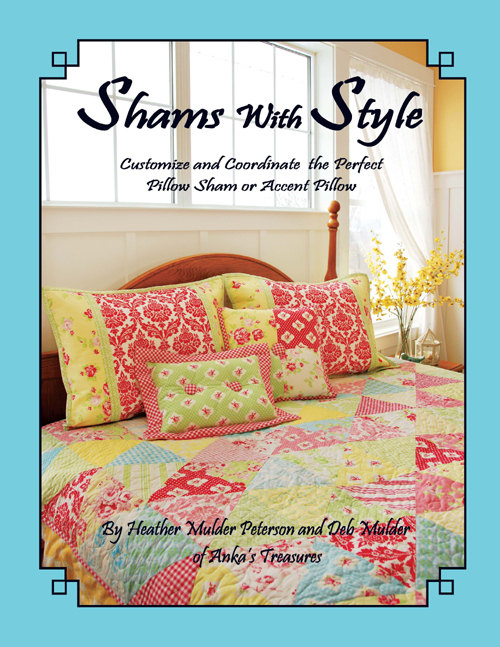 I hadn’t thought very much about how nice special shams might look with quilts. These all look so great- It looks like another terrific book. Love Love Love these pillows Heather! What a perfect compliment to our homemade quilt treasures! Oooh! I love the pillows! I need a pillow to go with a quilt I just made too! Perhaps these will be perfect! Wow, love all the shams and pillows! What a great idea! Happy Valentine’s Day! My bed and chairs could definitely use some new pillows! I hope I’m a winner! Thanks for all the inspiration. If I win the book, will you come and help me redo my room-yours looks amazing! What a wonderful idea! I love the pillows! Such great ideas for the pillows. They are different and look doable! I’ll be watching for the book. Your new book is an awesome idea. I just made pillow shams for my MIL for X-mas and there are not a lot of patterns out there. I can’t wait for this book to be available at my local quilt store. Awesome pillow patterns. I hope my local quilt shop will have this book and your Bella Bag pattern soon. I want them both! Keep creating such great patterns and fabrics. What great pillow ideas!! Thanks for the chance to win your book. Shams they are classics and yours are beautiful. Great giveaway, thank you! So brilliant, Aunt Betty! I love what you’ve done with this idea. Looks like a book I must have! I NEED this book. I loe all the pictures and ideas. I read this blog like 3 times:) Here’s hoping!
. . . and it only took the last 7 months?! You are amazing, and your Mom is amazing, and your fabric is amazing! I love them all and would love to have a copy of your beautiful book! The pictures are so inspiring, and that little niece of yours almost steals the show . . . ok, maybe she did! Congrats to you and your Mom! Lovely book. I’ve made one set of shams to match a wall hanging. I need to make some throw pillows too. It does make a lot of difference. If I don’t win the book — I’m buying it when it is available! Thanks. LOVELY! I am a huge fan of your work! Your pictures are so inspiring. Better get to my sewing room today! Hoping to be a lucky winner. It is refreshing to see something different! Your timing of this book could not be any better, as I have just purchased the fabric to make a new quilt for my master bedroom. The pillow shams will make for a nice finishing touch. I cannot wait to see the book in person. A job well done to both you and your mother. I enjoy watching for your posts and was delighted to find this array of pillows. They are beautiful and look forward to seeing your book in print. And it’s often fun to partner. Lots of new energy. Love it! I’ve made pillow cases, but the shams are really what I need. Can’t wait for the book to come out. I always find your blog so entertaining and have most of all your pattern books. Thanks for sharing your talents! Ditto to Carol’s comments (2 above me!). 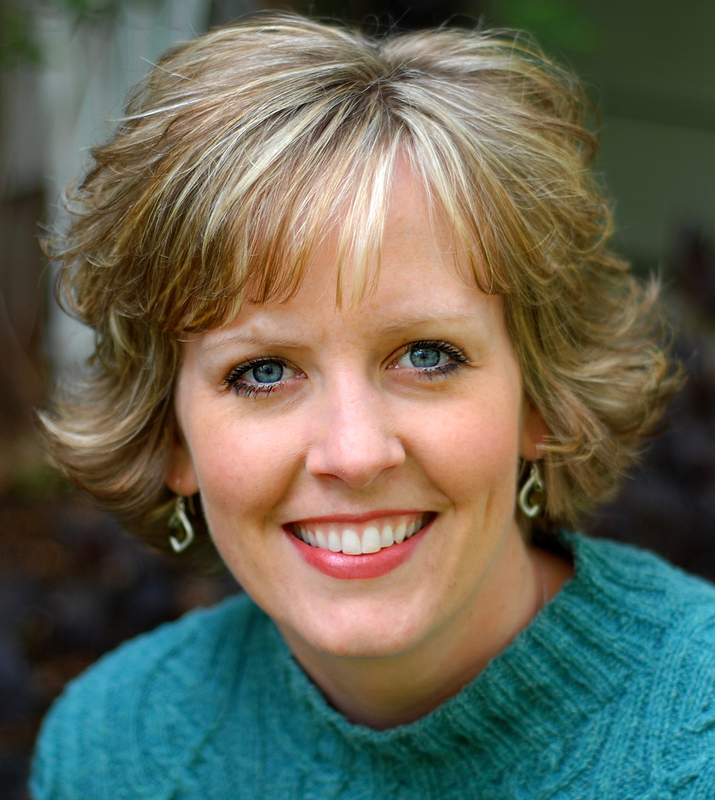 I love your work and your photos of your quilts, decorating ideas, and beautiful bedrooms are just incredible! Makes me look at my bedroom and think… it could use some TLC. Beautiful pictures and rooms. Makes me want to move in or sew up my own room. So excited! I always love your work. Wow I love these. I have so many ideas now! Wow what beautiful creations! Can’t wait to buy the book! I know this will be a huge hit and definitely is the perfect way to finish off a quilt made for the bed … truly makes the whole ensemble unique! Also, love the different styles to use elsewhere in the home. Terrific! I gotta say, I’m impressed. I really like the pillows and they don’t look impossible to make! What a great idea! This is a much needed book. I love home dec and pillows. And I just happen to have some pillows to make for my son’s quilt I gave hime and our new daughter-in law for their wedding. This is perfect! Wow! They are all so beautiful! Thanks for the opportunity to win! These are beautiful and something I need to learn to make. Thanks for a chance to win one of these books! Terrific photos, colors and lighting! Love your pillow ideas! The right pillows can really add alot of pizzaz to a bed or room. I’d love to try some of your designs. This is exactly what I have been looking for! Thanks to Aunt Betty for getting the ball rolling on such fun ideas to dress up the pillows. Cute…Like your books this is a post that you can keep coming back to to brighten your day, thanks. I have made shams to match my quilts for years but your book looks like it has some fresh ideas for me! Great job as always! What a great idea. If I don’t win I plan on buying this book. I just think these pillows are so dang cute! As always you have came up with another great idea, and you too “Aunt Betty”! Love it! I love them all!! Great ideas! Your work is lovely and you have given me so much inspiration! They’re gorgeous, I love them all – need to find out where to buy the book from so I can get started making them, I can’t wait!